SolUrlCacheBrowser is a simple Windows application to browse cache information of Internet Explorer. SolUrlCacheBrowser can be used to browse cookies, visited urls and other cache data for Internet Explorer. It displays those cache data in an XML format by using an Internet Explorer Browser embedded in SolUrlCacheBrowser. This is a very basic application program based on Windows wininet cache APIs. 1. Run SolUrlCacheBrowser program on your desktop, then a Windows window will be displayed. 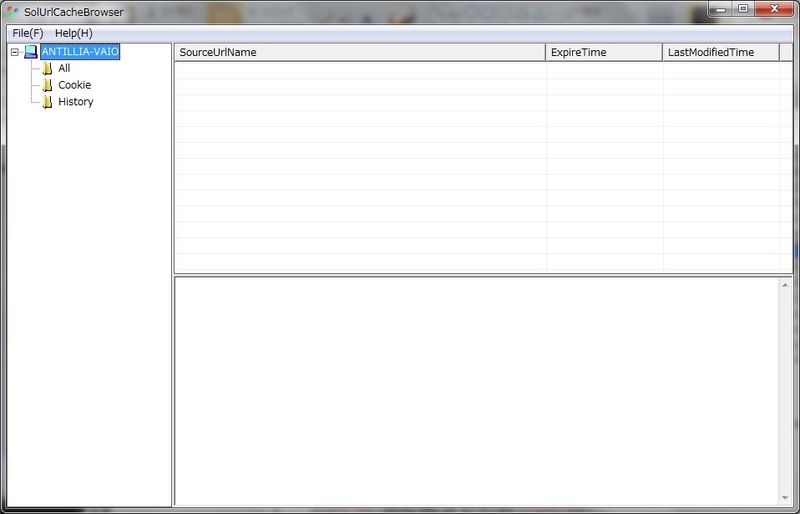 The window has a treeview in the left pane and a listview and an internet browserview in the right pane. See Figure 1. 2. 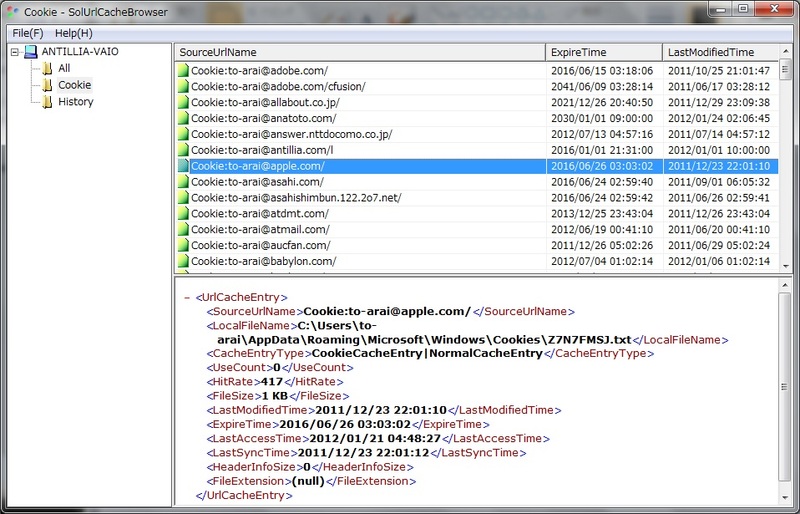 To browse of cache data of Internet Explorer, select a cache type in the left treeview. See Figure 1. 3. 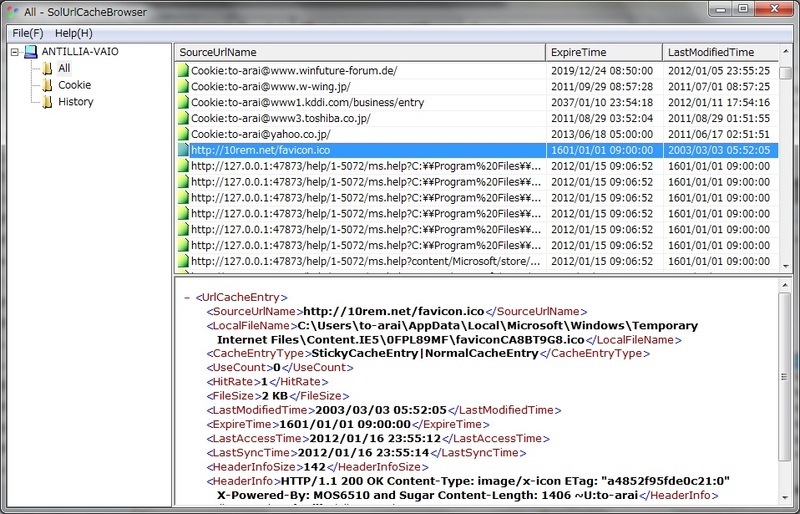 Select 'Cookie' item, then all sourceUrlNames of cookie cache entries will be displayed in the left listview. Select a sourceUrlName in the listview, then the cache data for the selected item will be displayed in an XML format in the browserview. See Figure 2. 4. 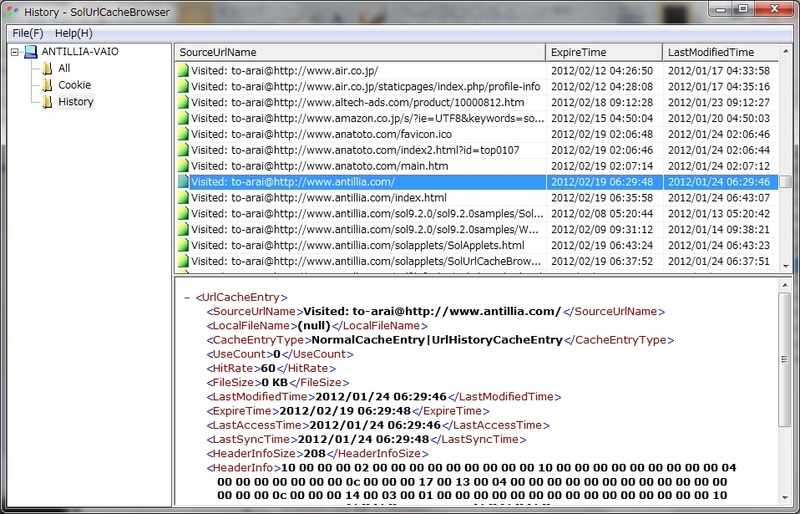 Select 'History' item, then all sourceUrlNames of visited url cache entries will be displayed in the left listview. Select a sourceUrlName in the listview, then the cache data for the selected item will be displayed in an XML format in the browserview. See Figure 3. 5. Select 'All' item, then all sourceUrlNames of cache entries including cookies, visited urls and others will be displayed in the listview. Select a sourceUrlName in the listview, then the cache data for the selected item will be displayed in an XML format in the browserview. See Figure 4.